Two more down, 300+ to go. Finished a couple of games this week and that’s always exciting as I get to choose what to play next. After knocking off Tomb Raider last week, it has been a lot of changes quickly for me and I feel slightly giddy and disoriented with all the changes. It rarely happens that my game, my game with my wife, and my game with my friend all finish within days of each other. (I also finished my audiobook, Black House, this week so that added to my sensory overload of media changing). My wife and I are changing up to True Blood Season 4. I think we are doing The Darkness 2 after that unless The Last Of Us suddenly goes on sale. My friend and I finished The Lord of the Rings: War In The North. Much shorter than I anticipated considering the big map you are presented with. We had a lot of fun with it though. It certainly has problems with the inventory system and my buddy had no end of grief with performance on his ATI cards that ended up being an unpatched but known issue with no work around. You could do better for a co-op game, but I really liked the combat and the spell system. It tended to blather on with conversations and really fails at capturing either the feel of the books or the movies, but it was fun...and in the end, that’s what you want from a game. I think I’ve convinced my friend to play Dead Space 3 with me next week as he bought the Origin Humble Bundle. He doesn’t really like horror games, but I think with two players much of the “horror” will be gone because you aren’t alone. I also just polished off Bioshock Infinite. The last third of the game pretty much redeemed the game for me, but it is definitely my least favourite of Irrational’s “Shock” games. The theme doesn’t do much for me and something about the level design and combat just didn’t do it as much for me this time. Fighting the same boss three times was a pisser too. I enjoyed the story and the atmosphere is definitely darker nearer the end, but I think the slow pacing at the beginning of the game hurts it somewhat. I’m sure they wanted the happier and brighter levels at the beginning to contrast the darker, moodier stuff near the end, but something is slightly lost in the delivery and impact for me. That said, it is still loads better than most shooters I play and it was engaging and a heck of a lot of fun to play. 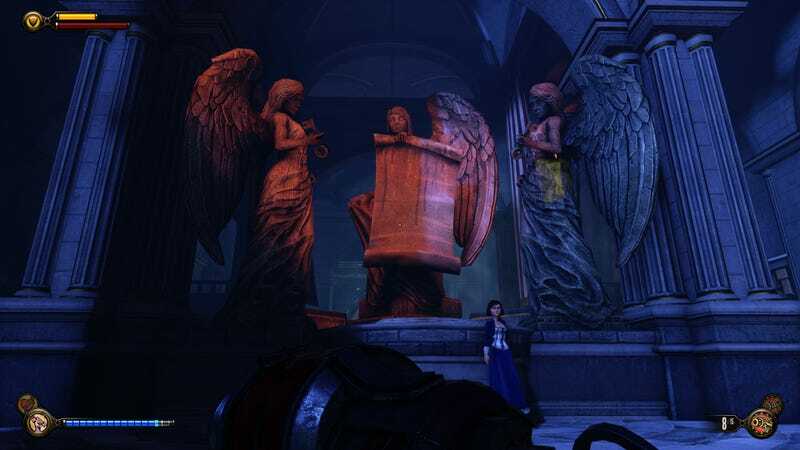 I look forward to the Burial At Sea DLC. I’m going to take another crack at Demon’s Souls and if that doesn’t end up being fun it will either be inFamous 2 or X-Com: Enemy Unknown as my next title, unless the iCEnhancer 2.5 suddenly drops. All this GTA press makes me want to play GTA IV, which I’ve never played.